The Tallahassee Democrat has spotlighted the work of Florida State University Art faculty member Denise Bookwalter in an article published this weekend. The article references multiple exhibitions Bookwalter has completed in the past. One such exhibition, titled “Shaping,” explored the tactile experience of textiles on the body using wools, cottons and silks. The series was accompanied by a set of large prints made from handmade paper with printed woodcut images. Another, called “Swatch,” used small laser- cut etchings to play with the ideas of color and ink mimicking textiles. 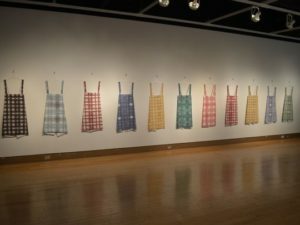 She then took those small samples and digitally printed them onto fabric that was then fashioned into aprons that the viewer could try on and wear. This week, Bookwalter will host a conference titled “Conspire: Collaboration, Cooperation, Collection,” which focuses on the interdisciplinary aspects of bookmaking and how it brings together artists, scholars, writers and others from many different disciplines. It also affords the opportunity to showcase the Small Craft Advisory Press (SCAP), an organization she began at FSU that facilitates collaborative artist books, giving tours of their letterpress and other equipment. In addition to the conference, Bookwalter will hold an exhibition at the William Johnston gallery called “Flash Point,” which will exhibit Bookwalter’s collaborative books with other artists in SCAP. To read the Tallahassee Democrat’s full article on Bookwalter and her work, please visit their website.